The holidays are here, and as a result, you may find yourself falling behind on your fitness. After all, your schedule is most likely packed with parties, shopping and other festivities that seriously cut into your gym time. But, here’s the deal… you can have your fruitcake and stay fit too. How? 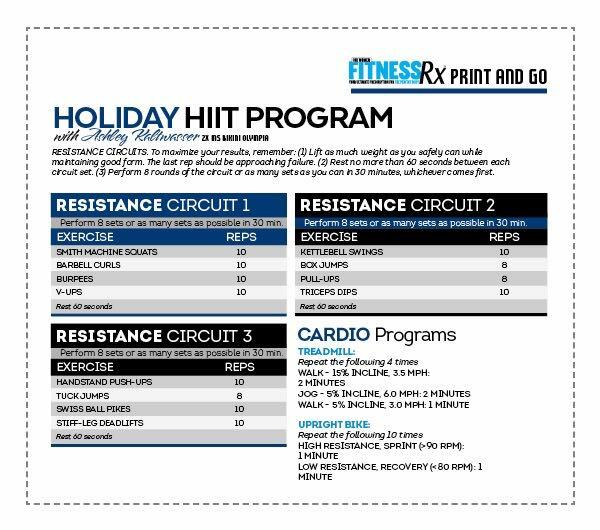 With a little holiday miracle called HIIT, or high-intensity interval training. When it comes to fitting fitness into a busy schedule, there’s no better option than HIIT. In fact, research has shown that the short but intense HIIT workouts burn more fat and calories than longer steady-state cardio or traditional weight-training programs. So simply put, HIIT allows you to get more results in less time. Now there’s something to celebrate! Our comprehensive HOLIDAY HIIT PROGRAM, demonstrated by two-time IFBB Bikini Olympia Champion Ashley Kaltwasser, takes the guesswork out of staying on track this busy and indulgent holiday season. Just follow our timesaving, metabolism-boosting resistance and cardio workouts, and you’ll be in and out of the gym in just 30 minutes! So you’ll have time to squeeze in a sweat, finish your shopping, trim the tree and make it to the party! Joy to the world! TOTAL BODY. Every session features power-based compound movements, fundamental muscle-building exercises and explosive plyometrics for a high-intensity workout that will burn a high number of calories in a short period of time. CHALLENGE. The key to this program, and HIIT in general, is training like you mean it. You have to lift heavy, push hard and make the most of every minute that you train. ADDED BENEFITS. In addition to burning tons of calories in little time, this program will help build strength, improve aerobic fitness as well as promote the production of anabolic hormones responsible for improved body composition. Too busy to plan your workouts this holiday season? We’ve got you covered. Here’s a seven-day plan!